I install a lot of driveways and patios, and some of my new customers are asking for stained concrete. I've never tried applying acid stains. What are the basic steps, and how can I avoid problems? I get questions like this one almost every week, and not just from first-time stain applicators. When applying acid stain, understanding the basics are vital to achieving good results. To see the four basic steps to staining and the proper procedures for each, see Acid Staining Basics. What is the best way to apply two colors of acid stain? Does it matter whether the light or dark color is applied first? The two most common methods for applying multiple colors of acid stains are "wet on wet" and "wet on dry." Both methods produce dramatic color effects that can take a basic stain job to the next level. For more on this, see Blending Acid Stain Colors. I applied a concrete stain to a large 8-year-old concrete patio in Reno, Nevada-an area subject to somewhat extreme temperature variations. I initially washed the patio with a mix of muriatic acid and water to clean it. I hosed it off, waited a day or so, and applied the stain with a sprayer, following the manufacturer's directions. Two years later, the patio now has areas of peeling. I would like to re-stain the whole patio again to make the color more uniform. I have heard that if you have washed a patio with muriatic acid, you cannot acid stain it. I am trying to find an expert who can tell me how to properly prep the surface, apply the stain and protect it. The stain I initially used was an acrylic. The product you used — a tinted acrylic stain — is not an acid-based concrete stain. It is a translucent concrete paint and is topical, which means it forms a colored coating on the surface of the concrete that will wear over time if not maintained. To get the full answer and proper surface preparation to correct this problem, see Acid-Etched Concrete — Re-Staining Your Concrete. I recently patched some minor cracks in a concrete floor and now I want to stain the entire floor. Will the repaired areas absorb the stain like the rest of the floor? I want the color to be uniform. Any time you stain a floor with repaired or patched areas, expect a color difference. The base color and character of the concrete has a lot of influence on the final color and look that is achieved when you apply translucent stains or dyes. For the complete answer and more information, see Color Differences When Staining Patches in a Concrete Floor. We have stained concrete floors, which were in the house when we bought it. The kitchen floor has many stains from grease. We’ve tried everything to remove them. Please help! Most stained floors have a sealer applied to provide protection. These sealers will only do so much in regard to protecting from food stains such as grease, oil, soda, mustard, etc. The type of sealer and how well it is maintained also play a big part in floor life and performance. For the complete answer, see Removing Grease Contamination on a Stained Floor. The concrete floor in our LEED-Silver-certified office building was finished with a leading manufacturer's water-based stain and then sealed with a different manufacturer's sealer, followed by the application of two coats of wax. Construction took place in December 2008, and the building opened for use in March 2009. After a couple of months, the stain and sealer began flaking off and scratching away under chair legs. A duct-tape test confirmed that the finish was readily pulling off. The floor finishing contractor returned in December 2009 to strip the wax and sealer and reapply stain and sealer from the same manufacturer's system. The floor finish appearance was improved in the short term, but has since worn off. A duct-tape test about two months after the refinish work pulled up colored stain material. 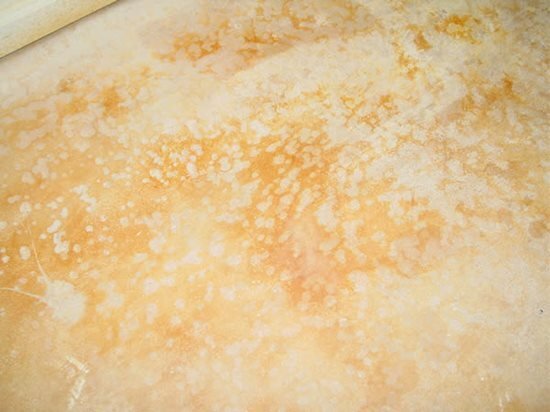 The finish also continues to have an uneven, or "crazed," appearance after washing with a mild pH cleanser, both when it is wet and after drying. The construction contractor believes that the concrete floor was installed correctly to accept a stain, because it was allowed to cure about six months before application of the stain and sealer and protected until the work was done. Note that the temperature at the jobsite was probably below freezing at the time of the floor finish work. What factors would contribute to the failure of the finish, even after reapplication? Typically failures like these are caused by a combination of factors, not just one. For the complete answer, see Flaking Sealer Caused by Overapplication of Stain. Can I acid stain concrete that already has integral pigment in it? We had our floor and shower just done in red-oxide tinted concrete and it ended up being pink! I want to change the color by applying an acid stain. The short answer is, yes. Acid stain will work on any concrete, colored or gray. The big difference will be the final color. For more, see Staining Integrally Colored Concrete. We applied an acid stain in a dark walnut color to a lanai. The stain took fine, and after rinsing, we tested a small area for final color approval. Finally, we sealed the job using two coats of a 30% solvent-based sealer. After only a week, the walnut color has faded dramatically. What could have caused this? As with almost all decorative concrete finishes, especially exterior work, the final color will develop over the first few weeks after completion. On stained slabs, gloss and color decrease in short order. Exposure to dirt, rain, sun and foot traffic all play a part in color retention, but sealer choice can also have an impact. Just to make sure, double check the type of sealer you applied and make sure it's recommended for use on an exterior stained slab. If the sealer is not designed for exterior decorative use, you could have a dramatic color shift and the stained slab could fade out quickly, as you are describing. An additional thin coat of an appropriate decorative sealer may be needed to restore the color. If the lanai is under a roof or covered from the elements, a sacrificial topcoat of wax can be used to help bring out the color. I recently stained a 5-year-old concrete floor. The owner of the building had rubber mats down on the floor near the front entrance for 4 years. After staining, I noticed the stain was significantly lighter in color in exactly the same spot where the rubber mats had been. What caused this, and how can it be fixed? The cause is most likely plasticizer migration. Plasticizers are chemicals added to plastics, vinyl, and rubber to make them softer and more flexible. The softer or more flexible the material, the more plasticizer it contains. Since rubber mats are fairly flexible, they contain a lot of plasticizer. Over time, the plasticizers migrate out of the rubber or plastic and are absorbed into surrounding materials (in this case, your concrete floor). Heat and pressure can speed the process. Since concrete is porous like a sponge, plasticizers migrate into the pores easily, filling them with small amounts of plastic that inhibit the penetration of water or stains. That's why on this project the stain was lighter only in those areas where the mats had been laying for years. Unfortunately, removing plasticizers from concrete is very difficult. A good degreaser or stripper can be used if the problem is detected prior to staining. If stain has already been applied, a dye or color wash can be put down to help darken the color in the affected areas. If the area has already been sealed, try applying a tinted sealer. Be sure to soften the edges of the tinted sealer to avoid turning a lighter color problem into a darker color problem. How do I fix areas on acid stained floors where the color has worn away? I also need advice on touching up spots that did not take the stain at all. I tried spot staining them and it only made them look bleached. The floors have not been sealed, only waxed. Problem areas that will not take stain. Trying to spot treat with stains often leads to bigger problems than those you started with. Staining is a process that works much better over larger surface areas because it looks more natural then small spot treatments. To help correct the problem areas you describe, proper surface preparation and pretreatment are necessary. First, I recommend conducting a water-absorption test by spraying a fine mist of water over the surface prior to staining to look for areas that are darker or don't absorb the water as readily. To help open the slab and create a surface that will take the stain more uniformly, try dry sanding using a rotary sanding scrubber with 150-grit paper, or applying a chemical pretreatment such as QC Con-Clean (available from QC Construction Products). It's always best to treat problem areas prior to sealing and waxing. If a sealer or wax has been applied, you can mix tints (either water- or solvent-based, in a color to match the stain) into the sealer or wax and then reapply to the small problem areas and blemishes. The last, and most important issue, is proper maintenance. The worn areas on the floor are likely due to lack of a protective sealer. You should always apply a base coat of sealer followed by a sacrificial topcoat of wax. At the first sign of wear, the wax should be reapplied to maintain a good wear surface. 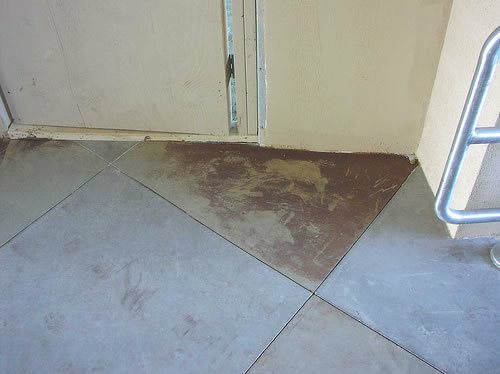 We have a project where the owner would like to install a stained concrete floor in the lobby of an office. Tilt-up wall panels will be cast on the floor slab, and the contractor is concerned the bond breaker will inhibit stain reaction. Can you please review and give recommendations? Tilt-up construction usually requires applying a bond breaker (a low-solids resin) to the slab on which the panels will be cast. If applied at the right coverage rate, the bond breaker will exhibit very little transfer to the base slab. However, any that does remain can inhibit the stain from reacting. Zep® Industrial Purple Cleaner, available at Home Depot, does a great job of removing most bond breaker residue that remains on the surface. A bit of scrubbing with a broom or walk-behind floor scrubber helps to loosen and remove the resin. (For more information, visit www.zepcommercial.com). To make sure no bond breaker residue remains after cleaning, spray the entire area with water. If the water beads up on the surface, more cleaning will be needed. Once you're sure all the bond breaker is gone, apply a stain sample to the surface to see how well the stain reacts and to allow all parties to agree on the final color. There are so many products on the market these days labeled as concrete stains. How do you know you are getting a true acid-based stain? A true acid-based stain reacts chemically with the concrete surface toproduce deep, rich color tones and attractive marbling effects. To simplify the answer to this question, I'm going to break down concrete stains into two families: reactive and non-reactive. With a reactive stain, a reaction takes place between the stain and concrete, forming a permanent chemical bond. Non-reactive stains are tinted coatings, sealers, or dyes that mechanically, not chemically, bond to the concrete surface. Instead, they fill the pores of the concrete surface or produce a colored film or coating. While reactive stains are available with either an acid base or salt base, acid-based stains have been around the longest and are the measure by which all other stains are gauged. True acid-based stains are made up of inorganic metallic salts dissolved in an acid and water solution. However, Mother Nature limits the color palette for acid stains. That's why most manufacturers offer only eight colors, mostly earth tones. A true reactive acid-based concrete stain is translucent, penetrates into the concrete surface, and leaves no film or coating. Non-reactive stains have grown in popularity over the last few years because they offer a nearly unlimited palette of colors and are easy to apply. The downside is that they lack the deep, rich, translucent color tones only possible with acid stains. While both stain types are viable options for the staining professional, it's important to be aware that each product requires different procedures for surface preparation. Most non-reactive stains require an acid wash to open and prepare the surface to ensure good mechanical adhesion. Surface preparation for a true concrete stain will NEVER recommend an aggressive acid wash to open the surface prior to application. 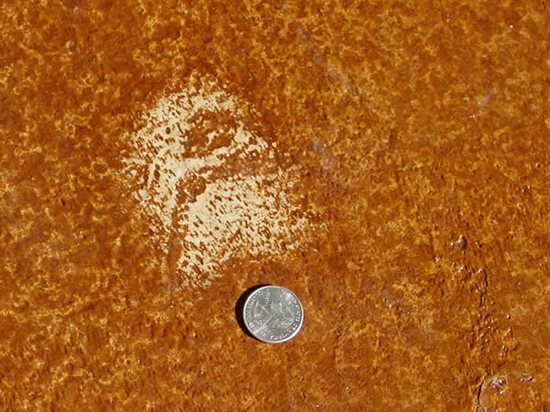 Applying an aggressive acid (such as hydrochloric or muriatic) destroys the cement paste at the surface that allows the acid stain to react and develop its marbled color variations. A hard-troweled concrete surface, rich in cement paste, is the food on which a true acid-based stain thrives. We tried using acetone to clean up a small area of water-based acrylic sealer that remained white after application to a stained overlay. The acetone removed all the sealer, but also took up the stain and some of the overlay. Why did the sealer remain white, and how do we fix the spot quickly, since the building owner wants to open tomorrow? The sealer was applied too heavily in this small area, which is why it didn't cure completely and turn clear. Usually, treating these white spots with a solvent will remove them quickly and easily. But in this case, the applicator was a bit too aggressive with the acetone and rag and ended up exposing the underlying white overlay. If time permitted, you could reapply stain to the affected area to see if the color would take. But since time is an issue, and there's no guarantee that the affected area will take the stain, you need a quicker fix. A simple method for disguising blemishes or off-color areas on stained concrete is to use an acrylic universal tint concentrate or paint. Although you can apply the tint directly to the substrate, the most common method is to blend various colors of tint into the sealer being used on the project until you obtain a close match with the stain color. Then simply brush or rub the tinted sealer onto the surface to cover the blemish (see photo). Some manufacturers of decorative concrete products offer tint concentrates in an array of standard colors to minimize the need for time-consuming onsite color matching and blending. In most cases, a perfect color match is not required, since a stained floor is expected to have a marbled appearance. The color only needs to be close enough to mask the blemish. A final note: Make sure the tint is compatible with the sealer you're using. Mix only solvent-based tints with solvent-based sealers and water-based tints with water-based sealers. How do you get rid of footprints in a stained concrete floor? It depends on whether the prints are in the stain or in the sealer. Footprints created by someone walking across a stained floor before sealing will be more subtle, appearing like shadows on the floor. Someone walking across the sealer before it has fully cured actually leaves a physical imprint in the sealer surface. The first type of footprint (in the stain) tends not to show up until after the sealer is applied. Membrane sealers, which are often used on stained floors, act as a magnifying glass and enhance the prints, making the problem more noticeable. In this case, you will need to remove the sealer, eliminate the footprints (by cleaning, sanding, or restaining), and reapply the sealer. If possible, treat the area around the prints as well to soften the patch. Removing footprints in the sealer can be relatively easy, depending on the type of sealer used. Solvent-based sealers provide for the easiest fix. Simply apply a bit of solvent (xylene or acetone) or another thin coat of the same sealer and then back roll. That usually removes the imprint in the sealer surface. You can also try solvents to remove prints in water-based sealers and waxes, but usually you will need to strip or sand these sealers to remove the surface imperfection. With either method resealing and waxing is required to finish the repair. As with any repair procedure, test the effects in an inconspicuous spot before repairing the entire area. I have a concrete slab that I want to stain, but the surface is loaded with lignite. Is there anything I can do to eliminate or minimize the lignite? Lignite, or "brown coal," is a soft low-grade coal with a high water content. It is found in many locations around the country and is often blended with hard coals as a cheap energy source. When aggregates (stone and sand) are mined for ready mix operations, lignite can often contaminate the mix. We see lignite contamination more often in the Mid-South region (Arkansas, Tennessee, Missouri, and Oklahoma). In concrete, lignite appears as brown and black specs on the surface. Since lignite is a hydrocarbon-based material and integrally mixed into the concrete, it is very hard to remove. Lignite will not take a stain and will become more evident after staining, especially if a lighter stain is used. Using a dark brown or black stain will help camouflage the lignite markings, but this is not always feasible. We have had some success using solvents or degreasers along with aggressive scrubbing to remove surface lignite. If lignite contamination is extensive, consider covering the entire slab with a polymer-modified micro-topping. The best advice I can give is to research ready mix suppliers in your area and use one that has a good reputation for sourcing and providing clean aggregates. How long do you need to wait before staining a thin micro-topping-type product? In general, polymer modified thin overlays less then ¼ inch in thickness cure out and can be stained in 24 hours. While they may not be 100% cured, they are dry enough to accept a stain without moisture effects. Once the 24-hour cure is complete, stain should be applied within a 72-hour window. If you wait longer than 72 hours, the overlay may become so hard that the stain cannot penetrate and react properly. Proper surface preparation includes but is not limited to dry sanding, mineral acid etch, and scrubbing, is always recommended when staining overlays. Sampling, as with any stain application, is always recommended. WHY DOES STAIN WASH AWAY? I applied a dark brown acid stain to six-month-old concrete yesterday. When I came back today to neutralize the stain, it all washed off. What can I do to get the stain to take? Stain will simply wash away if you don't open the surface pores of the concrete first and allow the stain to penetrate. In this case, the concrete surface had not been prepared properly prior to stain application. Onsite tests conducted to troubleshoot the problem showed that a mineral acid and detergent scrub were needed to "micro-etch" the surface (open the pores without changing the surface profile). This allows the stain to penetrate the concrete and react. Fixing the problem simply involved preparing the surface in this manner and then reapplying the stain. The stain was first applied to sample areas to assess the results. After 5 hours passed to allow the stain to penetrate and react, the samples looked great with very little residue on the surface. I acid stained a driveway today and plan to return tomorrow to clean and neutralize the surface. We are expecting rain tonight. Do I need to cover the driveway with plastic or do anything to protect the surface because of the rain? The short answer is, yes! No matter what color acid stain is used, there is always excess stain (called "stain residue") remaining on the surface. Acid stain residue contains some un-reacted stain, which will discolor most anything it comes in contact with. If it rains, the runoff will carry some or all - depending on the amount of rain - of the residue with it. Darker colors tend to leave more residue than lighter colors. Depending on where the runoff goes, this could be a small issue or a major problem. I have seen stain residue carried by rainwater runoff permanently discolor brick, sidewalks, stone, and vinyl siding. Covering the surface with plastic would help, but it is hard to keep rainwater from getting underneath and causing the same issue. Plastic can also affect the appearance of the stain where it touches the stained surface. If rain is in the forecast, either postpone staining or make sure the residue is cleaned off before the rain starts. What causes the permanent droplet and pour marks when acid stain first hits a concrete surface, and how do I avoid them? This is known as acid burn. Some concrete surfaces react instantaneously when acid stain is applied. These instant reactions leave a permanent color differentiation and outline in the form of a droplet (from a sprayer) or pour mark (from a jug or container). These color differentiations and marks are hard to remove, and most of the time even additional stain applications applied soon after will not remove the marks. A common method to avoid this problem is wetting the surface prior to stain application. The damp surface will slightly dilute the initial reaction and eliminate surface acid burn. Remember to be consistent! Stain applied to dampened areas will react differently than when applied to dry areas. Another method I have seen used by skilled applicators is to dampen a small area, pour or spray stain in that damp area to avoid acid burn, and then use a brush or automatic scrubber to move the stain around, being careful to maintain a wet edge. No matter what method is employed to control acid burn, produce jobsite samples to see how the concrete reacts and what the final color will be. More information about acid burn and how to avoid it can be found in Gaye Goodman's book Advanced Tips and Tricks for Acid Staining. We seem to be experiencing more and more concrete slabs that are not taking acid stains, even when we grind them first with a #150-grit diamond disc. The acid stain is not even producing full color development inside a ¼-inch sawcut. The problem is only happening on slabs less than two years old. We were told by stain and sealer manufacturers that the problem is due to the addition of plasticizers to the concrete or that the portland cement in the concrete was replaced with as much as 20% fly ash. Do you have any test data to substantiate this, and could the use of sodium silicates and lithium hardeners also have negative effects on the development of stain color? I have no hard evidence to support that stains don't take due to the addition of plasticizers to the concrete, but evidence does exist to support that a high fly ash content will limit stains from developing their full color. If you consider that admixtures such as plasticizers and water reducers have been used for decades in concrete, I doubt a strong case can be made that these are causing the problems. Plasticizers are used in such small amounts in comparison to the overall volume of concrete that it would take a mix design with massive amounts of these chemicals to cause an issue. Chemical admixtures used in excess may cause a reduction in color development, but the chemistry and historical track record do not support outright color rejection. In terms of fly ash, this can cause a problem, but only if it is used in high doses-in excess of 20%. Fly ash will increase durability and concrete density and consume free lime, thus "stealing" the raw materials that stains need to produce color. (Acid stains need to be able to penetrate into the concrete to get at the free lime for a reaction to occur.) I always recommend pure cement mix designs or the use of less than 10% fly ash if staining is to be performed. Keep in mind that it is your responsibility, as the stain applicator, to make sure the slab is ready to accept the stain, whether you poured the concrete or not. Take the time to look at the batch tickets to see what's in the concrete mix, and always do a sample prior to stain installation to ensure that the color is correct. "Closing" the surface vs. "opening" the surface by grinding. I am seeing more and more applicators using diamonds to try and open up the concrete, but in actuality they are tightening the surface even more. Total lack of surface preparation-just apply the stain and hope for the best. There are not many situations in which concrete does not need some type of surface preparation prior to staining. As a side note, the use of concrete dyes eliminates most of the issues discussed above. Dyes are significantly smaller in particle size than acid stains, penetrate into much harder and denser concrete than stains, and don't need any free lime to develop their color. The trend in the industry is moving toward dyes and away from stains based on ease of use, time and labor savings, and elimination of potential color problems. IS IT OKAY TO USE AN ACID WASH BEFORE STAINING? I get very different answers on how to properly prepare a power-troweled concrete surface for application of acid stains. Some people say never to use an acid wash to open the pores for staining and others say it's OK to use an acid wash of 10 parts water to one part acid. Who's right? As a general rule of thumb, you shouldn't use an acid wash to prep for an acid stain. Acid etching will destroy the cement paste that is needed to develop the stain color. The only time I recommend using an acid etch prior to acid staining is if the surface is superhard with a dense, burnished finish. Other types of stain that aren't acid-based, such as acrylics, may also require acid etching before application. To determine what type of surface prep is required, do a stain test first. In my opinion, a 10:1 water-to-acid wash ratio is way too strong and will destroy too much of the concrete paste. I always recommend starting at 40:1 for any type of acid etch. Can acid stain be applied to existing concrete pool walls to add color? How will it hold up underwater? Applying a stain to pool walls is not a good idea. Over time the stain will be leached out by the water. Sealers will not hold up for long periods of time underwater either. I always recommend using a pool plaster designed specifically for underwater applications. 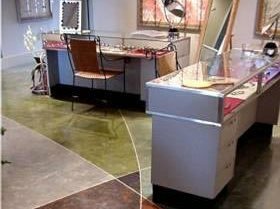 I saw your Concrete Network articles and those of others about acid-stained concrete floors. But I did not see any articles on retouching stained concrete floors. The reason I'm contacting you is that I have a 2x2-foot hole in the middle of my beautiful stained and scored concrete living room floor caused by jack hammering to repair a water leak under the foundation. Any suggestions you could give me regarding how to go about repairing and restoring the floor to its original condition, and on a $2,270 budget, would be appreciated. Can the hole be filled in with concrete and bull floated evenly, then rescored with a new diamond blade at the appropriate depth? Can the 2x2-foot bull-floated area be retouched to match the original brownish-red stain color, and if so, can you recommend what acid stains to use? Or will we have to apply an overlay on the entire living room floor to get a reasonable match? This is one of the more interesting issues I have come across in 10 years. What a tough break and situation. Trying to patch a stained floor is truly one of the hardest rehab jobs out there. You need to match the texture and finish of the concrete, and then match the color and tone of the stain. Any patch material - concrete or polymer - will stain differently, so it will be virtually impossible to get a good texture and color match with any type of patch. For suggested options to solve the problem, see Color Differences When Staining Patches in a Concrete Floor. We converted our garage into two bedrooms. I just put the first coat of stain on the concrete floor. The day before we stained it, I pressure washed the concrete with a little Joy dishwashing liquid. When we cleaned the floor, we found a few spots of paint on it, a brand called KILZ. We got the paint up, but those spots did not take the stain; they are still gray concrete. Why didn't those spots take the stain? KILZ, as well as all other primers and paints, are comprised of different chemicals. Some of these chemicals are designed to promote adhesion by bonding deep into the surface being coated. The surfactants, resins and oils -- if it's an oil-based system -- will actually soak deep into the surface. The porosity of the surface (concrete is considered a very porous material) will dictate the depth of penetration and the strength of adhesion. In your case, the resins and oils soaked into the concrete, which is why you still have a stain mark, even after the surface coating was removed. Resins and other chemicals in the KILZ leached out of the coating and into the concrete. They are typically not visible when the surface is dry, but show up when wet, as they resist the water from penetrating. To remove the spots, you need to use a soap designed to cut heavy oil or grease to emulsify the contamination, and then you need to soak it up. Depending on the length of time the stain has been on the concrete, this can be a quick process or a long, slow process. As a side note, since your floor has already been stained, and there are only a few spots, it's often best to just leave them alone as "character marks" in your stained floor. Attempting to remove them now that the floor has been stained can actually create a bigger spot that ends up looking worse than the original. What is the drawback of acid staining a residential concrete floor the day after the concrete is placed, rather than waiting the suggested 28 days? Is this recommended waiting time the same for both acid and water-based stains? As soon as water meets cement, a chemical reaction starts and it takes approximately 28 days for concrete to achieve 90% of its strength. During this period, crystals start growing, which are the glue that holds concrete together. You don't want to bother those crystals with any distractions while they are developing and hardening. Stains, especially reactive acid stains, are one such distraction. The other factor to consider in the first week after the concrete is placed is moisture content and how that might affect color development. The higher the water content, the more the stain (whether it's water or acid based) will be diluted and the lighter the color. Goofy side reactions can also take place with excess water in the concrete, possibly resulting in funky color development. All that being said, will staining destroy concrete if applied 24 hours after placement? Probably not. Will it be a roll of the dice what the color looks like, how permanent the color will be, and whether a weak surface will develop? Probably. I usually take a middle ground on these issues. Typically 10 days to 2 weeks is enough time for a good cure before staining, especially in warm, dry conditions. Wet, cool conditions will slow things down. Applying a sample of the stain to the actual surface is the only way to really see what you're going to end up with. Learn more about how to buy concrete stains.